(l-r) Sandrine Holt, George Eads. Tristin Mays and Lucas Till star in MACGYVER. ©CBS Broadcasting. CR: Guy D’Alema/CBS. HOLLYWOOD—The action series “MacGyver,” which made a problem-solving star of Richard Dean Anderson in the ‘80s, gets a 21st century reboot Friday Sept. 23 at 8/7c on CBS with an all-new cast. The updated “MacGyver” stars Lucas Till (Havok in the “X-Men” films) in the title role of Angus “Mac” MacGyver who works for a secret U.S. government agency. Using his considerable problem-solving skills and scientific knowledge he manages to get out of dangerous predicaments and save innocent lives from terrorists and other bad guys. 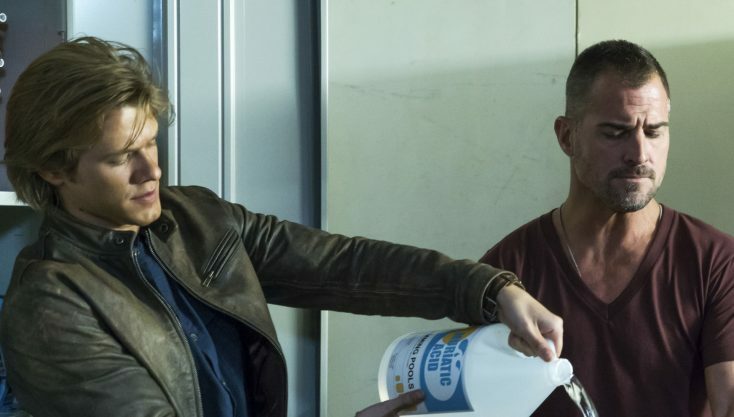 While the original MacGyver character essentially worked alone, the 2016 incarnation has a cadre of helpers. 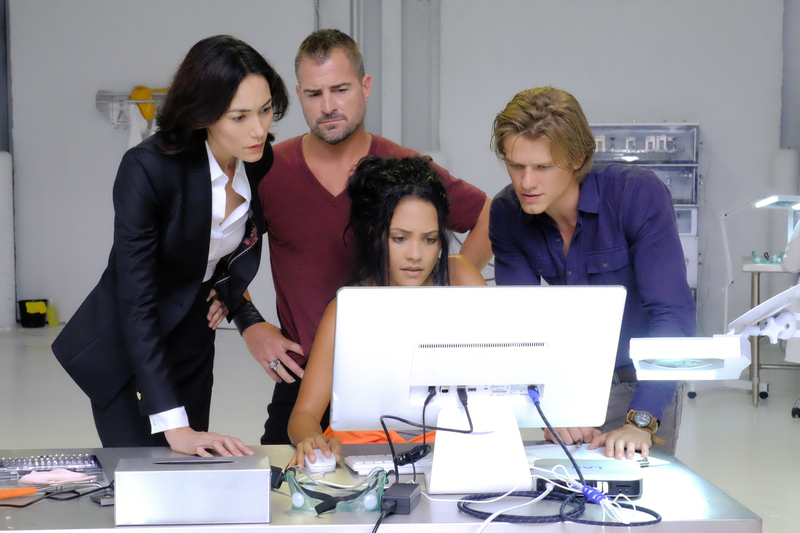 The creators of the new series (Peter M. Lenkov, who also is credited with the success of the rebooted “Hawaii-Five-O,” now in its seventh season) has surrounded the intrepid hero with a support team: former “CSI” star George Eads as teammate Jack Dalton, Tristin Mays as computer hacker Riley Davis, Justin Hires as MacGyver’s roommate Wilt Bozer and Sandrine Holt as Patricia Thornton, their boss. The series’ executive producers include James Wan and Henry “The Fonz” Winkler. At the Television Critics Association press tour, the stars of the new series spoke about taking on the classic show. Q: Lucas, you’re in the title role of an iconic character that uses his mind rather than weapons in difficult situations. Till: Yeah, I’m playing Angus. It’s funny. I grew up with firearms. I’m actually very proficient with them, and I don’t touch them on the show. Q: George, how is it working with Lucas and fostering a chemistry with him? Eads: We are finding it and we are not defining it before we do it. It kind of stems from a pretty healthy friendship between us away from the camera. We try to bring as much of ourselves as we can to it through really looking at the work before we do it the next day, maybe find some nuances and trying to just, kind of, go all out and make it real. Maybe if it’s real, in the end, it’s not right or wrong. It’s just real, and if people can identify with what we are doing, then we’ve done our job. Q: Lucas, how do you set yourself apart from Richard Dean Anderson’s depiction of this character? Till: There are a couple different things that I won’t say out loud, but I just kind of want to accomplish these things because, my dad, all he cares about is that I’m MacGyvering things, but he was an understanding individual. He’s charismatic, and he was always compassionate. There are lots of episodes where he’s, like, helping out street orphans. There are a couple of things that you just have to nail, and really, I’m discovering new ones every day as I talk to people on the street. They are, like, “Well, just make sure you do this right.” And I’m, like, “Oh, it’s only just…” and “put it on my tab.” It’s another thing I’m thinking about, but yeah. Q: The original series was fairy straightforward drama. How is this different, tone-wise? Eads: We try to keep it light and acknowledged that right away because, when I first read the first 10 pages of the pilot episode, I was kind of laughing because I was imagining it being “MacGruber,” (the “Saturday Night Live” parody) not “MacGyver,” but I like to laugh. Even when we are rehearsing, sometimes I’ll say, “Do it like MacGruber,” and (Till) will go into the voice, and we’ll do the scene (a little more campy) just to lighten the mood a little bit. Q: There are a lot of physical demands to your role. How do you deal with it? Eads: There’s a lot of moaning and groaning from our bodies aching after a long day that we save for the car ride home. I kind of don’t want to let people see me sweat. Q: Sandrine, could you tell us about your character? Holt: I play Patricia Thornton, who is the boss lady. They are young blood, and I sort of see my character as sort of old school, Black Ops‑trained, the boss that just is in the field sometimes and kind of tries to keep things from being derailed, which doesn’t work all the time. I’m sort of like the parent (to this group). Q: Tristin, you’re the computer techie on this team. What can you tell us about your character? Mays: I play Riley. I’m the one who actually brings the technical aspect to the show, all of the computers and the cameras and the gadgets and stuff like that. I’m the one that helps him sneak past a security camera. I’ll hack into the servers and all of this stuff and figure out how to get him through a building. So I do bring that sort of technological aspect to the show. Q: Is there room for improvisation? Till: It’s a lot of long days, and there’s times where I even forget because (the script) will say, “Lucas runs” or “MacGyver runs through the street,” blah, blah, blah.” And, then, it’s like 90 degrees outside, and it’s really humid, and you are in a leather jacket. And you are, like, “Man, this is taxing.” I didn’t even chalk this on the list of things that I was going to be doing stunt‑wise, but at the same time, I don’t know if I’d survive if I didn’t enjoy it, and I do. Q: Were you a fan of the original series? Hines: I personally grew up watching it. I was born just in the nick of time to catch it when it first started airing, and so I used to watch it with my father. Even now, me and Tristin in our trailers tune in to a TV network that plays episodes of the original show and we watch it. Q: Have any of you ever had a “MacGyver” moment in real life? Mays: I am the queen of April Fool’s Day. Every year I make this stupid contraption where I’ll tie this clothes hanger above the door, and I’ll put a paper cup through it and fill it with water. When my brother opens up the door, it spills the water on him. So that’s my MacGyver invention that I do every year. I keep it up in the closet.